There will be two hour lunch breaks on Friday and Saturday, which means there is plenty of time to leave campus for more lunch options, or to linger over one of the local options. The most convenient lunch location is the campus center. The options are listed here. The best option is Lemonade, which is upstairs, and offers moderately priced fresh healthy food. Unfortunately, it will be closed on Saturday. There is a food court downstairs with fast food options (pizza, burgers, Mexican, coffee), and a market next door that offers salads and sandwiches. I don't know which of these will be open on Friday or on Saturday over the summer. A fancier sit-down meal can be had at the Moreton Fig, which is under a large fig tree on the main campus walkway, right next to the ATMs. Because of the two hour time span, it is perfectly reasonable to take Metro back to downtown to eat at The Taste, which is a food court, on Figueroa St, just a block from the 7th St/Metro Center metro station. All the options here are quite decent and convenient, and it is easy to eat as a large group. There are also other options within a block or two of the metro station, but they may not be quite as convenient and fast for a group. People planning to eat lunch here should get a day pass when they board Metro in the morning. 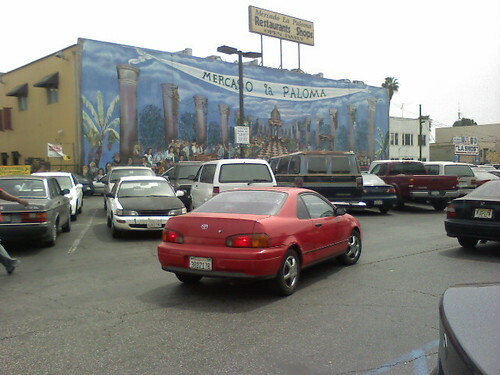 One other good option nearby is the Mercado La Paloma, which is about a 15 minute walk from the philosophy department. (You walk under the freeway overpass and just past the DMV.) This is a collection of restaurants and markets serving the locals. There are many different regional Mexican cuisines here (especially from the highly regarded restaurant Chichen Itza), as well as Thai food, vegan Ethiopian food, and several other options. There are many other options available, and the lunch break time should be enough to get to anywhere along the Expo Line (including the famous Earlez Grill on Crenshaw Blvd).